In this production still for "All of a Sudden Peggy," Jack Mulhall and Marguerite Clark kneel and act a scene in front of a tapestry. 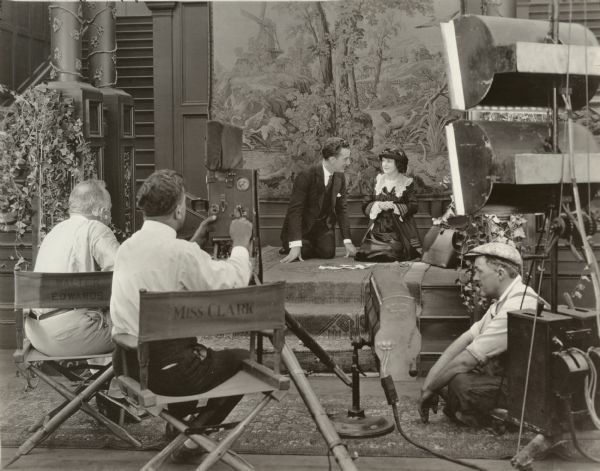 In the foreground, Walter Edwards sits in his director's chair at left (with a pince-nez stored on his right ear), and next to him cameraman William Marshall cranks a Pathé studio camera. The gaffer sits on the floor at left behind a small Kliegl spotlight and under several Cooper-Hewitt lights.